Reading and share top 5 famous quotes and sayings about Demanding Attention by famous authors and people. Browse top 5 famous quotes and sayings about Demanding Attention by most favorite authors. 1. 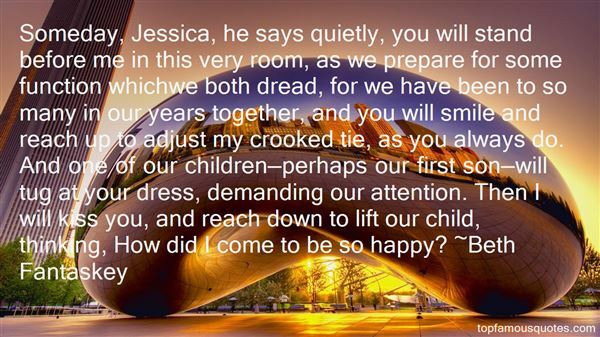 "Someday, Jessica, he says quietly, you will stand before me in this very room, as we prepare for some function whichwe both dread, for we have been to so many in our years together, and you will smile and reach up to adjust my crooked tie, as you always do. And one of our children—perhaps our first son—will tug at your dress, demanding our attention. Then I will kiss you, and reach down to lift our child, thinking, How did I come to be so happy?" 2. 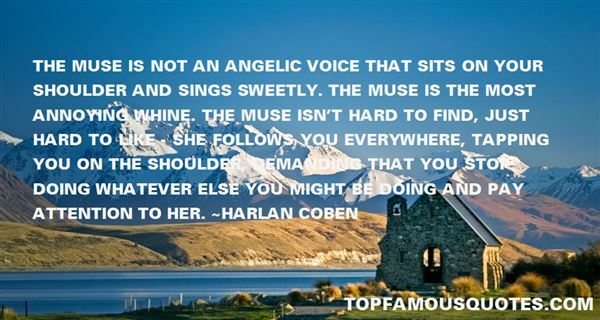 "The muse is not an angelic voice that sits on your shoulder and sings sweetly. The muse is the most annoying whine. The muse isn't hard to find, just hard to like - she follows you everywhere, tapping you on the shoulder, demanding that you stop doing whatever else you might be doing and pay attention to her." 3. "Even then, it hurt. The pain was always there, pulling me inside of myself, demanding to be felt. It always felt like I was waking up from the pain when something in the world outside of me suddenly required my comment or attention." 4. "Whatever wisdom I have has been hard-earned – each meaning carefully culled out of the dictionary of human experiences and emotions and put in its precise place in the matrix. Meaning doesn't come easy. The Great Crossword Setter in the Sky is capricious and wilful, demanding absolute obedience. You can waste the better part of a lifetime arguing about the randomness of the clues, the setting of the squares, why a certain square is black and not white as you need it to be, question the whole point of doing the crossword – what, after all, is to be gained by solving it. Only after all the chattering is over and you give your complete attention to it, does the perfection of the pattern reveal itself. As is, where is, everything fits. And at the end, when it's all done, there is no reward to be had – the joy of doing it right is all the reward there ever is. (A Deepavali Gift)"
5. 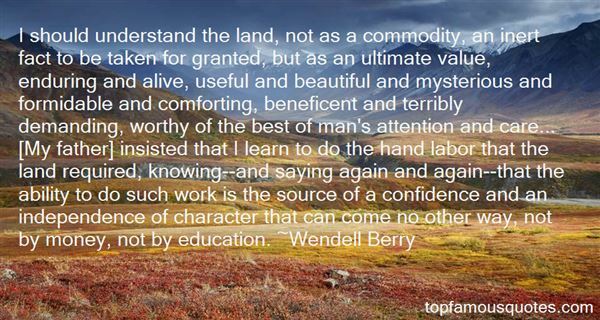 "I should understand the land, not as a commodity, an inert fact to be taken for granted, but as an ultimate value, enduring and alive, useful and beautiful and mysterious and formidable and comforting, beneficent and terribly demanding, worthy of the best of man's attention and care... [My father] insisted that I learn to do the hand labor that the land required, knowing--and saying again and again--that the ability to do such work is the source of a confidence and an independence of character that can come no other way, not by money, not by education." We were in the middle of a scene, and this crazy woman comes roaring out of the crowd, screaming, grabs my whip, and damned if she didn't punch me." Rubbing his reddened chin, the man's lips curved a little. "It's almost funny, but still, she ruined our scene."